And I have no idea where you are going with the magnetic field stuff. 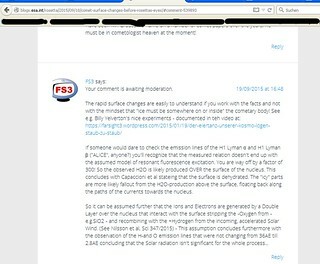 All that proves is that there is nothing electrical happening on the nucleus! If an electric field doesn't have a corresponding B field, or magnetic field, it means the electric field is made up with nearly equal amounts of photons that spin left as photons that spin right. The spins cancel each other out, and no magnetic field will be detectable. If all the photons are spinning the same way, then you get a magnetic field from their angular momenta. The point being, just because there isn't a magnetic field, doesn't mean there isn't an electric field. It is well known where the magnetic field in the coma comes from. The IMF. If there is a magnetic field in the coma, then the electric field there has coherent spin. The fact that comets have a coma indicates electrical activity. The coma is a plasmasphere. and that is what creates the electrical stresses. The field hangs up around the nucleus, and piles up. Hence an increase in the magnetic field. I like this. Such a good scientific explanation. The field hangs up what around the nucleus? I presume you mean like the swamp (NASA's term for the "piled up" solar wind) at the heliopause. 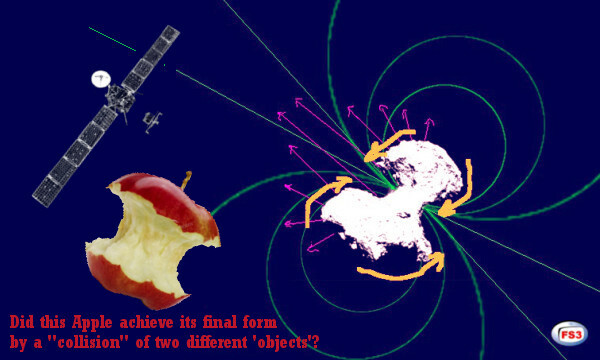 So... piled up magnetic fields is what causes the comet's magnetic field? Within that piled up field is a diamagnetic cavity. That is, there is zero magnetic field within it (i.e. no electrical activity either). Are you assuming no electrical activity because of the magnetic cavity? Are you aware that not all electric fields have a magnetic component? The solar wind isn't penetrating it, and neither is the IMF. As measured. At Halley this was at ~4500 km. At 67P, a few hundred. The solar wind doesn't penetrate any plasmasphere. Mars and Venus do not have magnetic fields, but they have (the equivalent of) comas. This is why it should be obvious that the silly idea of the solar wind creating water is laughable. The comet is well out of the Sun's equatorial plane, where the Solar wind is. But the Sun's electric field extends to there. It isn't reaching the nucleus for long periods. It is travelling too quickly (i.e. the H+ is too energetic to combine with anything). There isn't enough of it by orders of magnitude. There is little, if any O- to combine with even if it were possible. Which it isn't. And the H2O at 67P has a very different D/H ratio to the solar wind. Need I go on? You are saying all these things for your sake, to keep yourself convinced. 1. Something is reaching the nucleus, causing heat stress and outgassing. You yourself have said. 2. There are protons out there, even in the ambient IPM. 3. There is an abundant supply of oxygen atoms from the Silicon Dioxide in the nucleus itself. 4. Oxygen ions react not impossibly, but very readily, with any passing positive ion. 5. The H2O from the comet is a different source to the H2O in the solar wind, so they should have different ratios. Solar wind = water = dumb idea. I think you missed hearing what you were being told. Electrical interaction = elemental dissociation = jets containing water. To use your style of summation. It is obvious where the ice and H2O (and other) vapour comes from; the place where it has been detected numerous times; the nucleus. Not denying there may be some water trapped in the rock. Just saying, the comet is not a dirty snowball. I think I'll give up on this place. I'm not sure what you believe in. However, that is what it seems to be; a belief system. It bears no resemblance to actual science. Giving up is worse than failing. Why don't they just say "the Sun's electric field"? It is the Sun's electric field that is between and beyond the planets. That's what generates the interplanetary magnetic field. Usually referred to as the Sun's magnetic field. I commented about this briefly on the other Comet thread, but think it would be appropriate to mention here that the alleged detection of "water" on extraterrestrial bodies has thus far been limited to the observance of 3-micrometer absorption patterns that are characteristic of OH- [hydroxyl ions], and phyllosilicates, ie. opal-like compounds that may have inclusions of OH- or H2O. The inclusion of water in these descriptions is wishful, because obviously that is the compound being sought. It cannot be stated with certainty [except by news-hounding reporters] that water innately exists in comet cores or other asteroidal bodies. It may be inferred that some water could be formed by the interaction of native hydroxyls with H+ [protons] in the solar wind. Or it could be assumed that such water is being released from below the dusty cometary surface. The latter assumption is of course the preferred report as it confirms the validity of the "dirty snowball" and consequently validates the expenditure of money used to search for it! In addition to the dry appearance of comets, the behaviour of sun grazing comets suggests that water and other volatiles are not a major component (as ices) of their interiors. The following is a quote from one of Steve Smith's TPOD articles from 2009. Nordheim, T. A. et al.